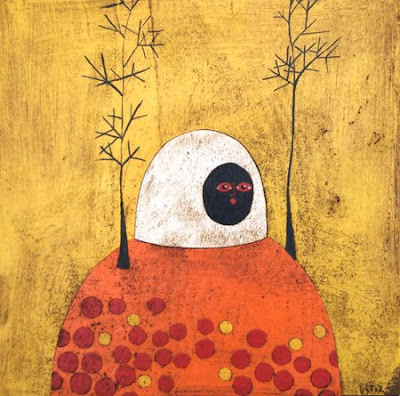 Influenced by colonial art as well as native indigenous artistic practices, Gustavo Ortiz’s paintings are distinctly Latin American in their hybrid blend of both European and South American heritage. Using collage as his primary medium, Ortiz combines the whimsical elements of Naïve art with the unexpected juxtapositions of Surrealism – creating a wonderful atmosphere of surprise, charm, and simplicity. Metamorphosis is the artist’s fist solo-show outside Argentina. He explains the show as "A careful description of the world, when our human prototypes went through a complete change of physical form and substance..."
The viewer will be taken on a journey through Ortiz’s bold universe populated by disproportionate human figures, animals, and objects, that tightly occupy reduced imaginary landscapes. While Ortiz’s paintings draw on the native myths and legends of Latin America, they also posses a decorative quality and tactile texture of the compositions that resonate with traces of indigenous art and craft. “The strong use of colour and the patterns of clearly defined shapes afforded by the medium of collage give an air of childlike naivety and understated humour to my paintings which offer narratives of the wonder and enchantment of human experience.” states Gustavo Ortiz.